One of the pleasures of being married can be splurging on holiday presents for your significant other. If that applied to you this holiday season, I hope you're not inclined to feel competitive towards other couples, because Kanye West is reported by TMZ to have spent some $14 MILLION on his present for wife Kim Kardashian: A luxurious beachfront condominium in Miami. The 4,700 square foot unit is part of a building in Miami known as the "Billionaire Beach Bunker," a moniker well earned by attracting a murderer's row of ultrawealthy tenants. 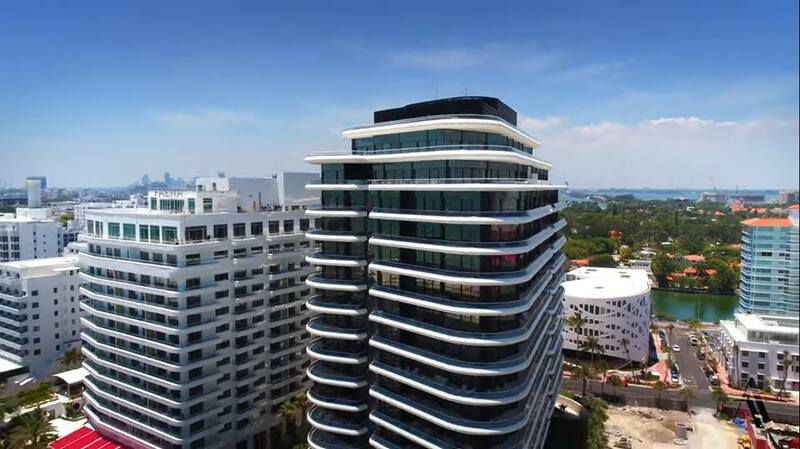 It's 18 stories high and comes equipped with the usual amenities like a gym, pool, and spa, and Kim's new place there has four bedrooms, five and a half bathrooms, and a giant terrace. Inside the master suite, you'll find a master closet by Ornare as well as bathrooms from Permasteelisa, while the kitchen features Venetian Terrazzo flooring and Miele appliances. According to the listing from Alexander Team, the unit is located on the building's A-line, "the most coveted line in the building." Miami is a natural fit for both Kim and Kanye since Kim once did a reality show in the city (Kourtney & Kim Take Miami), while he's a regular attendee of the city's annual Art Basel shows. That's reportedly how Kanye was able to check out the condo on the sly, putting down his offer in secret and then surprising Kim with the gift on Christmas Day. And even at $14 million, the condo is something of a bargain, since it was originally listed at some $1.5 million higher. The deal will be fully finalized sometime in January. The second suit is aimed at Roc-a-Fella Records, UMG Recordings, Def Jam and Bravado International Group, the first label being of course co-founded by Jay-Z.